· Improved yields with precision irrigation, reduced power costs with smart pump control, and crop damage preventions with selected alarms. AquaMon remote sensor nodes extend the reach of AquaMon. Remote sensor node can connect to multiple sensors monitoring soil conditions, weather changes, and equipment parameters. 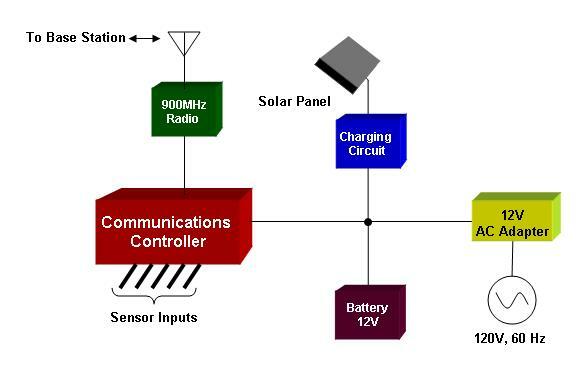 Control outputs from the remote sensor nodes permit the remote activation of equipment. Remote sensor nodes connect to the AquaMon base station over a 900 MHz wireless network. Sensor data is sent to the base station over this network at the request of the base station. The 900 MHz network permits communications up to two miles from the base station. If the site requires communications over greater distances or terrain limits the range, repeater nodes may be installed to extend the range of the AquaMon wireless remote sensor network. For maximum versatility AquaMon remote sensor nodes can handle a variety of sensor types. SDI-12, 4-20 milliamp, and 2.5 volt analog sensors can all be connected to the remote sensor nodes. The remote sensor nodes also provide digital outputs which can activate or deactivate connected equipment such as pumps, valves, and lights. These control lines permit the grower to remotely control systems in the field from the secure web server. These control lines can be activated automatically when preset conditions are reached or the grower can manually activate/deactivate the systems. AquaMon remote sensor nodes vary with the number of sensors required and power source. Remote sensor nodes can be supplied with one or two sensor boards. Each sensor board permits the connection of up to six sensors. When AC power is available, the remote sensor node can be powered through a 12 volt adapter plugged into a standard 120 Volt AC outlet. A battery backup is available to allow base station operation to continue during the loss of AC Power. Where AC Power is not readily available, the remote sensor node can utilize battery power as the primary power source. In this configuration a solar panel is available to maintain the battery charge.